8" Teaser reel. 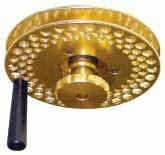 All models are single spool, manual 8". Available in stainless (silver), anodized gold, and white powder coat. Pictured in anodized gold.